The question has come up, on more than one occasion, "How do you harvest honey?". Some people want to know more details on how we do it while others have just never had access to the information. 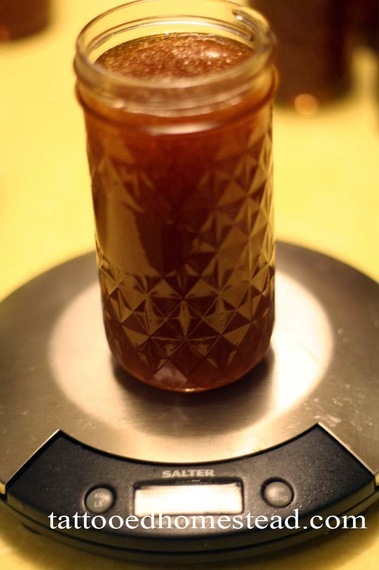 So below is a kind of photo essay on one method, a rather old fashioned one, called appropriately "The Mash and Strain Method." 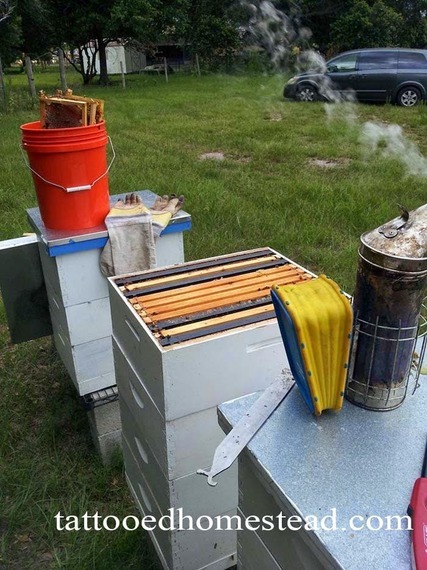 Now, this is not the way we ALWAYS harvest honey. We also have an 18 frame extractor for those big harvests. But on a average day, for just a few frames, this is how we go about it. It doesn't require any special equipment, just a bit of ingenuity and items available in any well stocked kitchen. We have several hives on the property. 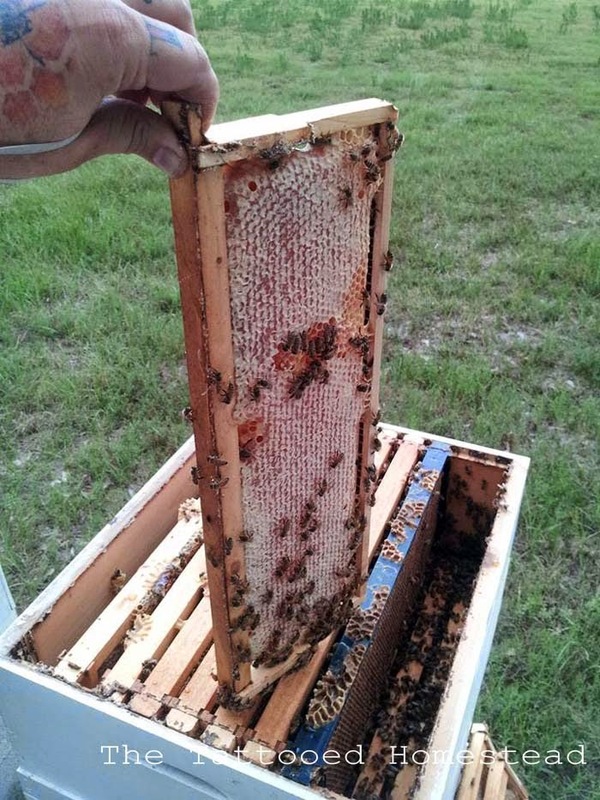 They don't require a lot of attention as we prefer to follow Natural Beekeeping ideals but we do inspect them as a routine just to make sure everything is moving along in proper order. While Hubby was doing one of these checks, he decided to grab three frames to harvest a bit of honey. 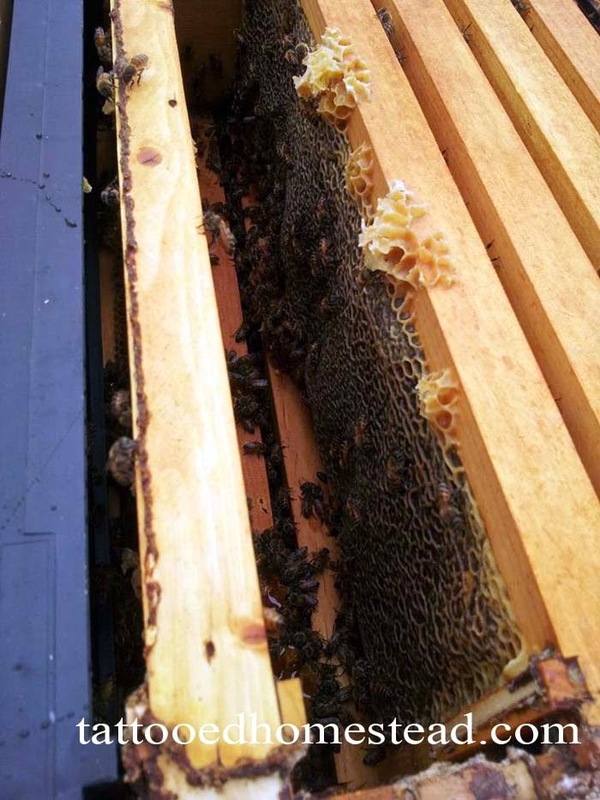 Inside the Hive, there are wooden frames to guide the bees in building to facilitate extraction of the honey, but as you can see, they sometimes build in other areas they like. He removes the full frame, and replaces it with an empty one. You don't want to leave empty spots in the boxes as the bees will start to build rogue comb in the space in odd directions. 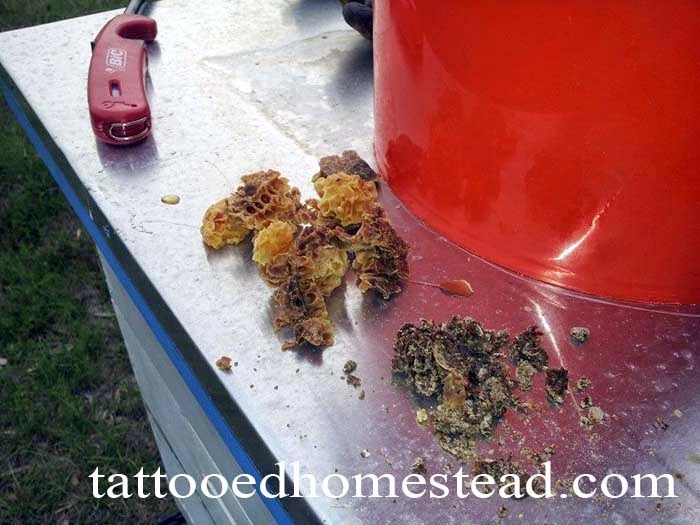 Hubby also took the opportunity to grab up any extra beeswax and Propolis. 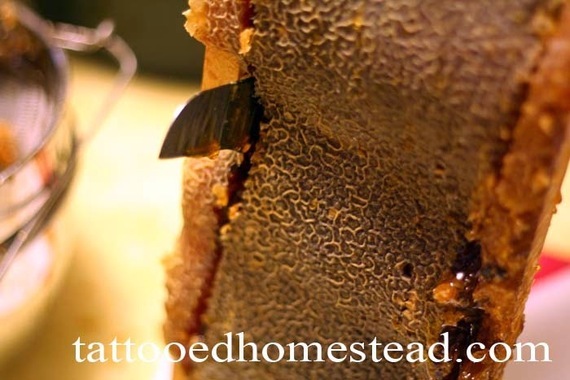 Propolis, also known as bee glue, is used by the bees to seal areas in the hive. 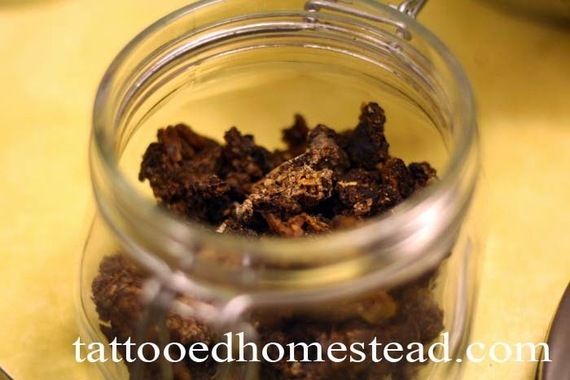 It has many healing benefits for the skin and has been called in the past natures band aid. 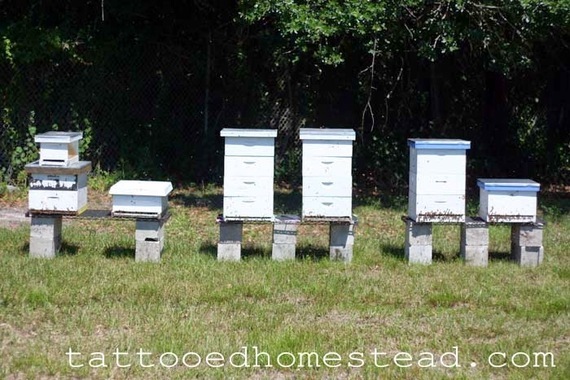 Hubby gently brushed the bees off the frames and brought them in the house. I placed them inside my larges crockpot bowl to hold while I got my tools together. A good knife is always key. Then I place it in our first level strainer. 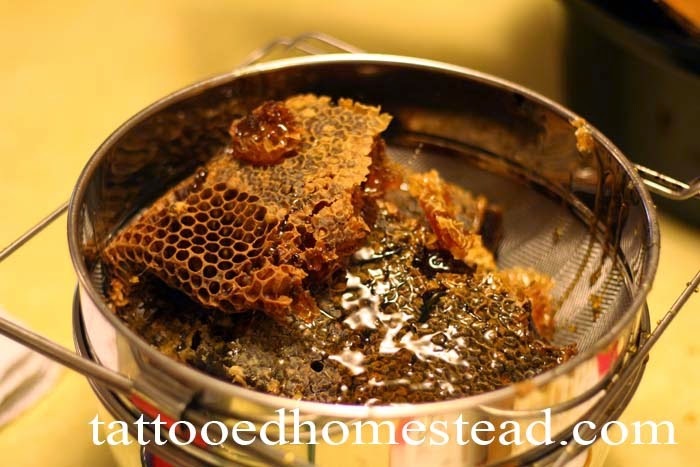 This one is specifically for honey buckets but any large strainer will do. Notice the strainer is not very fine. 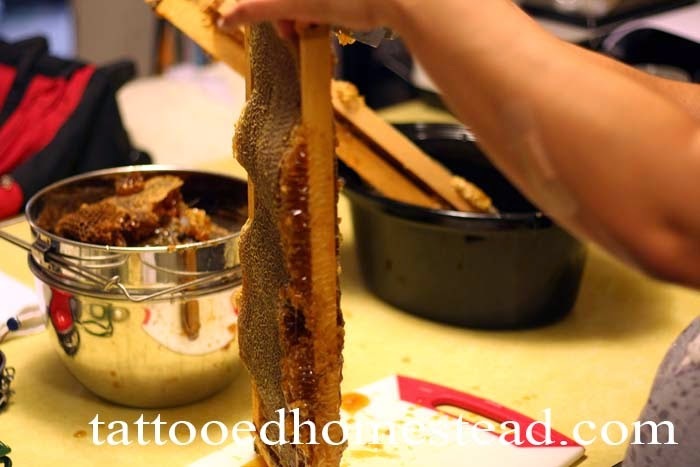 It's mostly to remove errant bee parts but leave in the pollen and other good stuff in the honey. 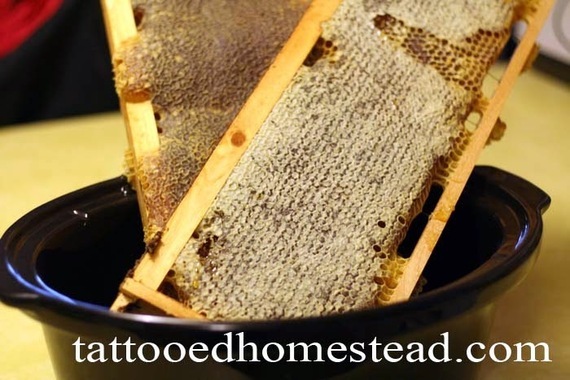 Tip: The best way to clean honey is with warm water and a clean cotton towel. 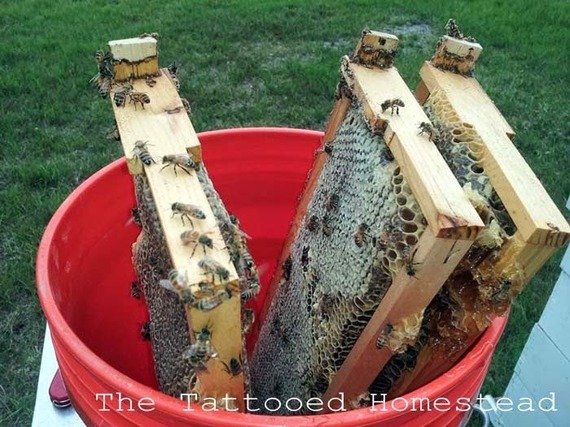 The warm water will melt the honey right off the surface. 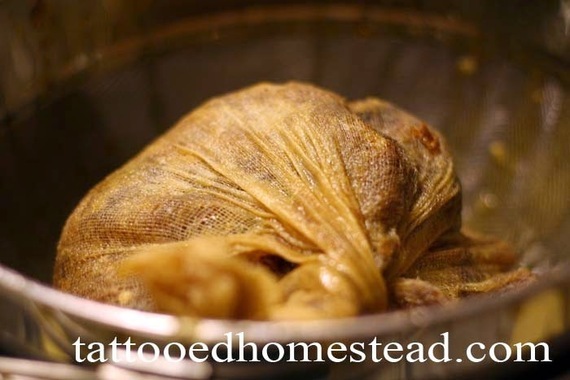 We then run the honey through a cheese cloth to squeeze out the goodness. Then ready for bottling. I'm a bit OCD about my bottling and like to be as exact as possible. 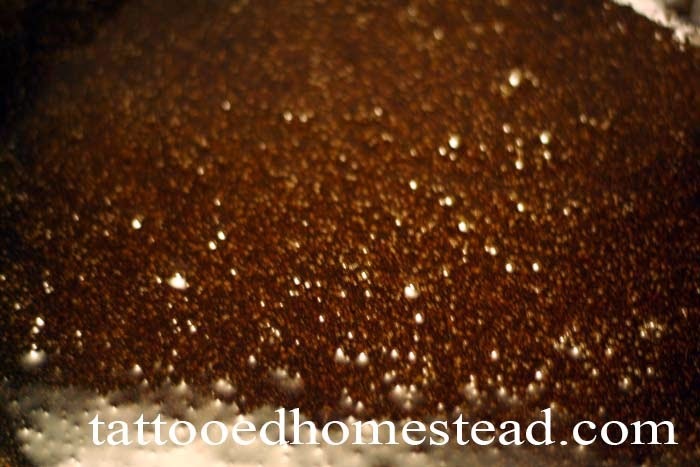 Hubby also brought me some Propolis so I add it to my store. 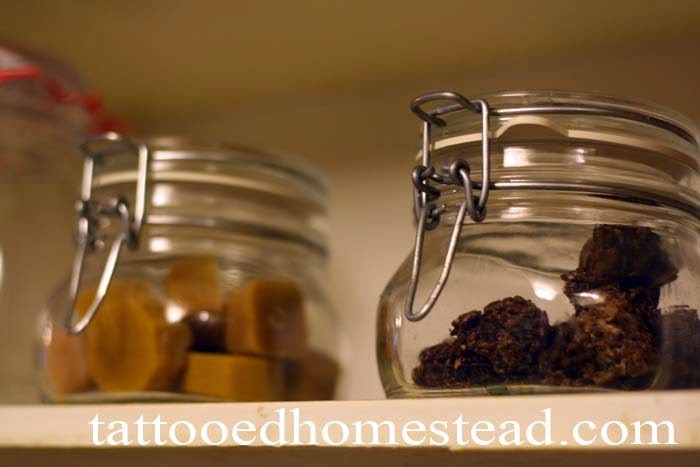 I use it for lip balm and salves and maybe tinctures in the future. 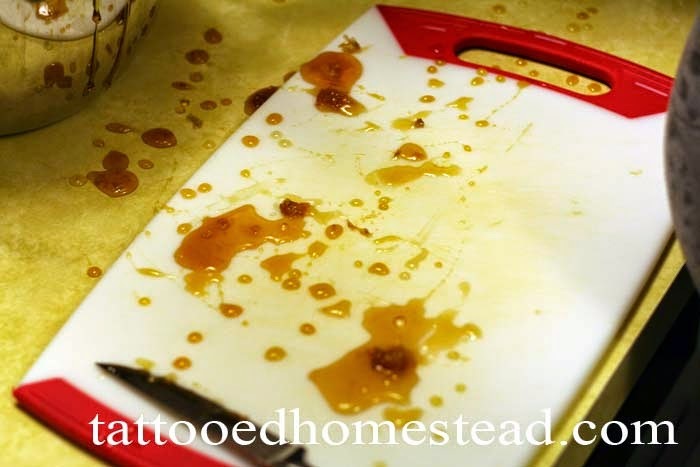 Once the honey is fully strained, I will also clean up the beeswax. 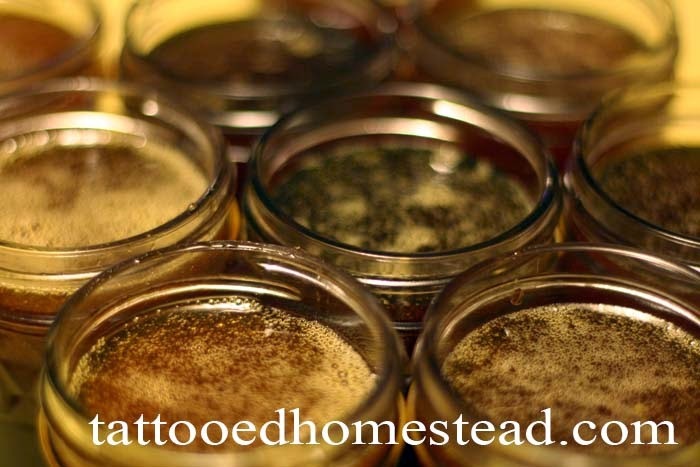 I use it for lip balms, salves, lotions, furniture polish and so much more. I also want to make a mustache wax for hubby but that is still in development. 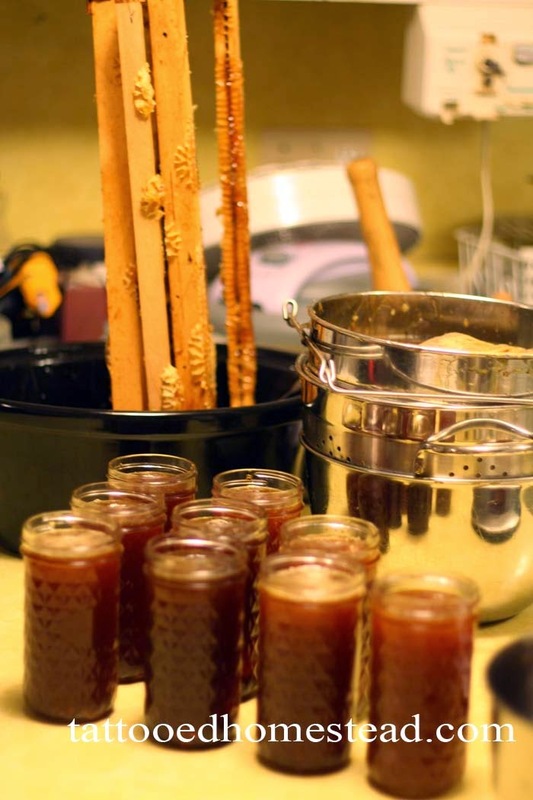 We allow the honey to settle and the bubbles leave. We are left we 9 10 pounds 5 ounces of wonderful Honey. All that from ONLY 3 Frames. We estimate each hive can produce 60 pounds of honey a year, but we don't take it all as we don't want to risk the hive becoming depleted and causing them to want to leave. 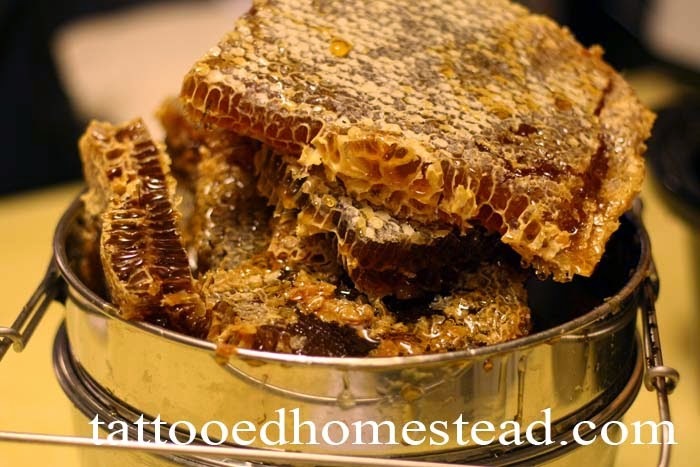 But even just one hive can produce enough for a family and to have some left to share.